This is another recipe which is very common in our place. Here is the recipe. First take a small pan, pre heat a drop of oil, fry coriander seeds, channa dhall, fenugreek seeds, red chillies to golden brown. Turn off the stove. Add the coconut to it, mix it well and let it cool. Grind it into a fine paste. Keep it aside. Now take a wide pan, squeeze the juice from tamarind (or add 2 cups of water to tamarind paste) add chopped raddish, onion, turmeric powder, sambar powder and salt and let it cook till the raddish becomes tender. Add some water if necessary. When the raddish becomes tender, add the coconut paste to it and let it boil for another 5 mts. Add water if necessary. Now add the cooked toor dhall to it and let everything cook for another 5 mts. This is sambar. Take a small pan, pre heat the remaining oil, add mustard seeds, when it splutters add fenugreek seeds, asafoetida powder and curry leaves and let it fry till golden brown. Pour it on top of sambar. Now sambar is ready to serve. Noolkol - 1 cup (chop it into small cubes). This is my all time favorite. 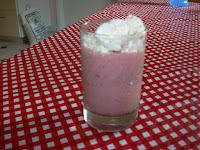 Here is the recipe for strawberry smoothie. In order to reduce obesity, we use this banana stem. It is good to drink this in the morning before breakfast(after brushing). Here is the recipe. This is a common juice we make. Some kids don't eat vegetables. For those kids, we can try giving this juice. Here is the recipe. I tried this cocktail when we went on a short trip to Las Vegas. 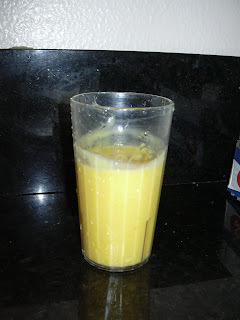 Here is the recipe..
Orange juice is full of vitamin C. I make this juice often and give my girls. here is the recipe I follow to make orange juice. Put everything in the blender and blend it nicely. Drain it and enjoy adding required amount of water. Pineapple is one of my favorite fruit. I still remember, when I was a school going kid, my dad used to buy pineapple juice for me every monday. Here is the recipe for pineapple juice. Just grind everything in a blender into a fine juice. Drain it if necessary and enjoy it adding ice to it. 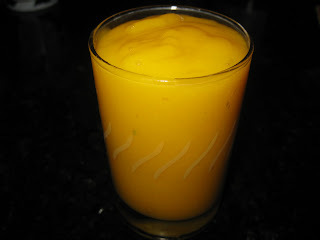 This is a simple juice with mango. Here is the recipe. Grind the ingredients 1, 2 and 3 in a blender into a fine juice. Pour it in a glass, add ice cubes and saffron to it and enjoy. I am trying to write some juices here for my friends' who asked for it. Here is the recipe for apple juice. Peel off the skin from apple & chop it into small pieces. Put it in the blender with water, sugar and milk and blend it into a fine juice. If necessary, drain it after blending. Add Ice cubes and enjoy. First chop the banana stem into very small pieces. add it immediately to curd, add salt to it and mix it well. Now take a small pan, pre heat oil, add mustard seeds, when it splutters add curry leaves and asafoetida powder to it and fry it till golden brown. Pour it on top of curd+banana stem mixture. Now vazhathandu pachadi is ready to serve. This is also a raita. This is my all time favorite recipe. Here is the recipe. Take a pan, pre heat oil, add mustard seeds, when it splutters add asafoetida powder and okra and fry it till it is fully cooked and tender. Okra needs to be fully cooked. Add it to the curd adding required amount of salt and mix it thoroughly. This is okra pachadi. Tomato Pachadi is my favourite. Here is the recipe. This is very simple pachadi which is basically raita. Most of the pachadi's are made out of yogurt and some don't. Here is the recipe. 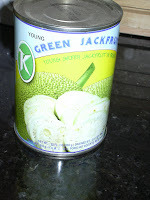 Just chop cucumber into very small pieces(squares) or shred the cucumber. Add yogurt to it. Add salt and green chillies to it. Take a small pan, pre heat oil, add mustard seeds and asafoetida powder, when it splutters, pour it on top of yogurt. Now pachadi is ready to serve. "Pulikachal Saadam" or Puliyodharai - This is how we call this in tamil. 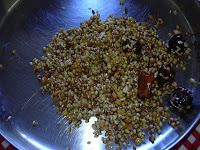 The preparation of pulikachal is time consuming. Now a days ready made pulikachal bottles are available in stores. But I dont prefer buying this from shop and make this rice. 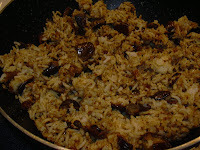 Here is the recipe for pulikachal and of course the tamarind rice!! Raw Tamarind - 1 medium lemon sized. First soak the tamarind in water for an hour. Take a pan, pour a drop of oil, fry the ingredients given for grinding, one by one, to golden brown. Let it cool and grind it into a fine powder. Keep it aside. Take a wide pan, preheat the remaining oil, add mustard seeds, when it splutters add urad dhall, channa dhall, red chillies, cashews, peanuts and asafoetida power and fry it till golden brown. Do not burn the ingredients. 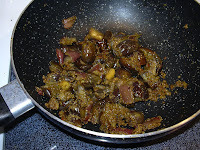 Squeeze the thick juice from the soaked tamarind for about 2 1/2 cups and add it to the fried ingredients. Add turmeric powder and salt and let it cook for 15 mts under low flame. The tamarind water should be really thick. 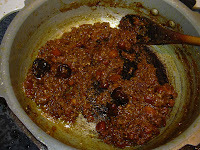 When it is fully done, you should see the oil spreading out the tamarind water. Now add the prepared powder to it and stir it thoroughly. If necessary, keep it in the stove for another 5 mts. ** Turn off the stove. Keep it aside. Let it be in the same pan for another 10 mts. This is pulikachal. Now take rice, pour 1 tbsp of oil and let it cool. Now add required amount of pulikachal to the rice and mix it thoroughly. If you need more color, then preheat a tsp of sesame oil, add 1/4 tsp turmeric powder, fry it and pour it on top of the rice. Garnish it with curry leaves. This rice can be eaten with chips. * - In this stage we can increase or decrease the amount of chillies according to our taste. ** - After adding the powder, some people will take out the pan from stove. I usually mix it on top of the stove keeping it there for another 5 mts. Mathan - This is how we call yellow pumpkin in my mom's place. 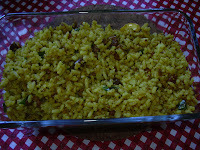 This curry is also very simple and this is another kerala Iyer recipe. Here is the recipe. First grind coconut + green chillies + cumin seeds without adding water. Keep it aside. Now take a pan, pre heat oil, add mustard seeds, when it splutters add urad dhall and fry it till golden brown. 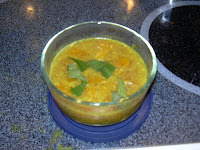 Now add the chopped pumpkin, salt and turmeric powder and let it cook adding required amount of water to it. Do not mash the pumpkin while mixing or stirring. 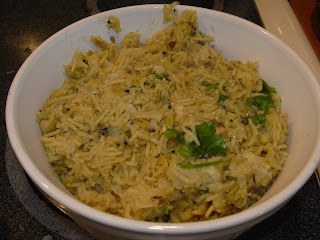 when it becomes tender, drain the excess water and add the coconut chilly mix to it. Saute for a minute. Turn off the stove. 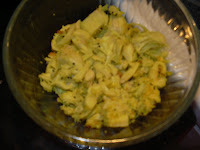 This is another side dish and will go well with some hot and spicy sambar rice because pumpkin's sweet taste will go very well with spicy item. 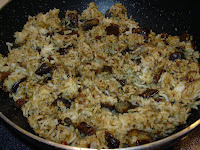 This is another variety rice we make using eggplant(Brinjal). Here is the recipe. First Pressure cook basmati rice after soaking it for 10 mts in water. Pressure cook it adding water in the ratio of 1:1 3/4 upto 2 whistles. Open the cooker after the pressure is released and spread the rice in a wide plate and let it cool. In the mean time, take a pan, pour a drop of oil pre heat it and fry the ingredients given for vangi bath powder to golden brown and let it cool. Grind it into fine powder and keep it aside. Take a pan, pre heat oil and butter, add mustard seeds when it splutters, add urad dhall and cashew nuts and fry it to golden brown. Add the chopped onions to it and saute for a minute. Now add the eggplant to it and add turmeric powder and salt(required for both eggplant and rice) to it and cook it for 10 mts. Make sure the eggplant does not mash while cooking. 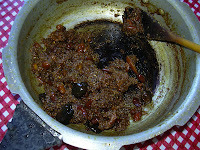 When its fully cooked add 2 full tbsp of vangi bath powder to the eggplant and mix it well. Now add the eggplant to rice and mix everything well. Garnish it with Coriander leaves. Serve it hot with Raita and chips.